I drove to Nashville and then back to Atlanta on Friday, to pick up my son from camp. All 8 hours in the car featured some amazing clouds/ships, as well as a phenomenon I had never seen before… An auric energy ray, radiating from earth towards the heavens! This photo was taken looking north while traveling east. 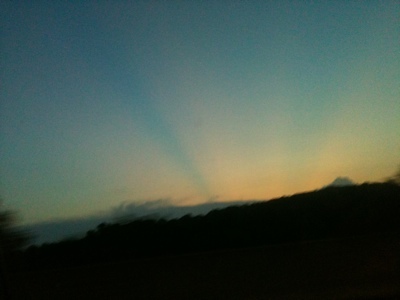 I was just west of Chattanooga, TN… The energy rays appear to be coming out of a huge mushroom cloud to the north (straight ahead, in this photo), which I had been driving around for about half an hour. In this photo, the sun is setting behind a mountain which is behind the car, very far to the left in this photo. These rays DO NOT come from the sun! Also you may notice that the most prominent ray, on the left, is green light. (Heart Chakra!) 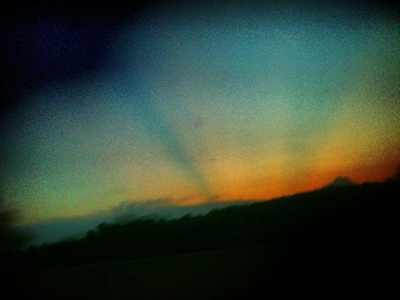 My son and I saw these rays coming out of the mountains for about an hour. When the sun was higher in the sky, they just looked like dark energy streaks. They emanated from more that one location in the mountains. The most relevant Ghost Radar words start at 6:40 and last until midnight. It was, Mike! I have never even heard of such a thing! Yeah I haven’t either! I am patiently waiting for our turn ;). Leslee, this has been documented but scientists don’t know what it is. The earth actually responded to a solar flare. I wonder if this was a similar thing? It is indeed beautiful to see, thanks for sharing.